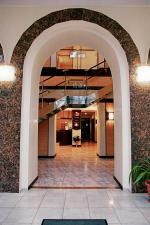 We are glad to greet you on the site of our hotel. 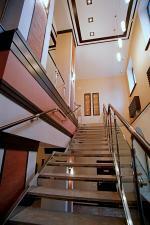 Hotel ZS Club is a business - class hotel. 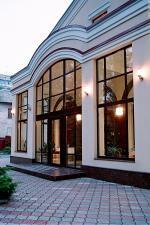 It is located near the Maxim Gorky Park (4 km) and cycling route (1 km). The first President of Ukraine Kravchuk L.М., Grand duke Michael (Poland), world ball dances champions (England) were the guests of our hotel, Folk deputies of Ukraine, businessmen from Poland, England, Spain, Japan, Germany, France, Belgium etc. 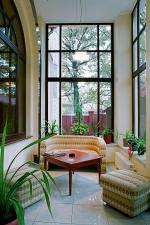 Comfort: quietness, cosines and peace, especially needed during business trips. Very high standards of service. We organize meetings, support and we provide safety to visitors of our hotel. Location: suitable location and road junction traffic for guests with autos (absence of traffic jams), free parking. Breakfast: "Continental" based on home-made food cooked exclusively on mineral water. Transfer: the hotel's SKODA SUPERB - prestigious car with air conditioning, individual light, personal distribution block of air flows - is at your disposal any time for any trip at reasonable price. Our professional driver will deliver you at the necessary place safely! You will have an opportunity to be convinced of quality of given services, as a variety of rendered puts our hotel in one number with respectable hotels of Ukraine. The Staff and Management of the Hotel. 61070, Kharkov, 2nd Lesoparkovy lane, 10. 09.07.2012 - Action from 9th.July till 9th.August 2012 yr.